India is an agriculture-based economy of which the majority of the population, especially in the rural and semi-rural area, derives their major source of income by engaging in agriculture and allied activity for their livelihood. Practically more than 50% of India’s population is largely dependent upon agriculture. Agriculture contributes nearly around 18% of India’s GDP. Therefore keeping in view the above importance and to facilitate the proper administration and to improve further the Government of India has introduced a new concept of a cooperative society which has been further improvised by giving the corporatized version. This cooperates version for farmers or primary producers is known as Producer Company. 1. What is producer Company? 2. Types of producer Company? 3. The origin of Producer Company? 4. What has its relevance in Indian Companies act? 5. Documents require incorporating Producer Company? Producer Company is a body corporate which is registered as Producer Company under part -IX A of company’s act 2013. It is a hybrid form of cooperative society with benefits of a limited company. Since Cooperative society has been doing a splendid job, therefore, it has been further improvised by giving the corporate version of co-operating society by aligning it with the provision of a private company. The primary object of Producer Company is too engaged in the activity of harvesting, cultivation, procurement, grading, handling, and marketing and engaged in export and import of primary produced product. Body corporate: Body corporate means a legal entity such as an association, company, person, government, government agency, or institution which recognized by a particular name and it is also known as the corporation, corporate body or corporate entity. Hybrid: The Hybrid means thing made by combining features of two different elements like a combination of cooperative society and a limited company. Primary products: The term primary product means goods available cultivating and harvesting raw materials without undergoing manufacturing process such as production, harvesting, processing, procurement, grading, pooling, handling, marketing, selling agriculture-based products. There various forms of producer company which is engaged in a variety of activity and rendering various services like production, promotion, technical assistant and conducting research for the producer, Financing producer activity or business involved in providing infrastructure facility to producers. The concept of Producer Company was introduced in 2002 by amending and inserting a new part IX-A into the Companies’ Act, 1956 based on the recommendation and report submitted by a high powered committee under the Chairmanship of Dr YK Alagh for incorporation of producer Companies. This act is further divided into 12 chapters. 4. What has its relevance in Indian Companies act 2013? There is no separate provision for producer companies under company’s act, 2013 It is governed by chapter IX of Company act, 1956. Therefore all the provision shall be applicable in the same manner as it was applicable under company’s act 1956. In order to incorporate Producer Company, we need to compile and comply with following requirements means any of the following or combination of producers can incorporate Producer Company. 6. Documents required incorporating Producer Company. Basically for incorporating any company the very first requirement at the beginning is to arrange and complete all the documentation part. Bank statement/Electricity bill/Mobile bill/telephone bill – Anyone. In addition to the above documents, you need to assemble and arrange other additional documents to incorporate Producer Company. 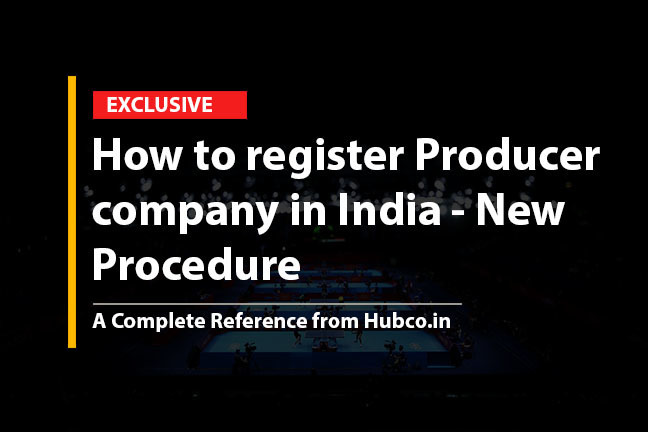 Registration of Producer Company is quite cumbersome processes because there are a number of forms and formalities involved however the process can be made easy by professional. Therefore you need to seek any professional help so that registration formalities can be made easy. The entire Director needs to have their own class 2 Digital Signature Certificate to digitally sign PDF documents which are on the internet. This issued either for only 1 or 2 years. It is mandatory for all individual who is proposing to be appointed as Director need to apply for DIN which is once allotted shall be valid for lifetime. For reservation of name one has to choose up to 6 desirable names in order of preference. Following conditions required to be fulfilled while deciding a name of the proposed company. The name of the proposed company should not be offensive, resemble or violation of any provision of the act. The name of your company must not resemble or sound the same with the name of another existing company. The name of a producer company must end with the words “Producer Limited Company”. Once name approved by the ROC it is valid for 60 days only. Following steps would be followed for checking the name availability. Once the name is approved by Roc the next step is to draft, prepare and vetting of the Memorandum of Association and Article of association of Producer company in accordance with the prescribed provision of Companies act. The documents shall be presented for registration to the registrar of the state where the registered office of the production company is proposed to be situated. There are certain documents that need to get it notarized by the public notary with the appropriate amount and on valid stamp paper. It is very much necessary to avoid getting rejection by ROC. After taking name approval, the next step is to file for incorporation via spice form INC 32. Further, PAN and TAN are not required to be filed separately and the same is allotted on company formation. If you are looking for registration services and would like to know more feel free to contact us at info@hubco.in and get a free consultation.